If you are looking to dress up your trailer, Trailer Tire Warehouse has overstock aluminum trailer wheels that they are blowing out at $67 a wheel. Sizes are 14", 15" & 16" wheels in various bolt patterns. 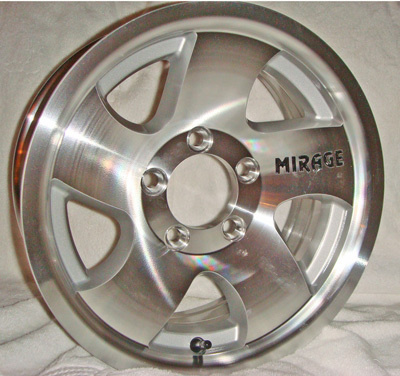 Wheels are new, never mounted Mirage OEM trailer wheels. Shipped UPS. Great source for trailer tires & wheels. I am looking for 10" alum rims? dont ya love the 1post wonders? ummm.... I could live in my sled trailer if i had to!! Can I get blow out tires to go with my blow out wheels? Does everyone know that the 5 hole patern on enclosed trailors are the same as Ford? I have Explorer rims on one and Ranger 4wd on the other! Good to know! Just need different load range tires. Yeah I kinda messed up last year! I had the Explorer rims and 215 trailor tires on my big trailor, and I lost the complete axel out the back! I put new axels, rims and tires on! 235 15's and now with 4 long track, big sleds, the tires hit the bottom of the deck! I found 10" alum rims! On Ebay! I ask the guy to come on here! Renegade got his at the Martin Swap Meet! They were $45 ea! I believe they were Galv rims and more of a traction type tire? The Ford?Nissan patern stock oem rims are rated alot higher and heavier than your trailers! Again I have the 15X5.5 Ranger 4x4 on one trailer and the Explorer 15x6 on the other! Belvedere, Il swap is this weekend! And Hastings Mi is coming up too!